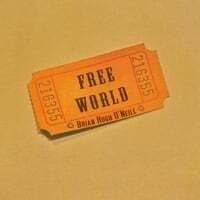 FREE WORLD is a collection of my solo material from my days with MINUS TED, the acoustic ensemble I formed in the early 90's with my pal Skipp Sudduth. Though we performed many of the songs live, they were never recorded or completed in the studio until now. The entire album was produced by Rolando Gori, a very gifted engineer who runs a small but extremely welcoming studio in Hell's Kitchen, New York called The Phone Booth. It is dedicated to my wife Tracy and my daughter Mairéad, the two pillars of my Free World.